Part 3 in our series on How to counter-punch botnets, viruses, ToR and more with Netflow focuses on ToR threats to the enterprise. ToR (aka Onion routing) and anonymized p2p relay services such as Freenet is where we can expect to see many more attacks as well as malevolent actors who are out to deny your service or steal your valuable data. Its useful to recognize that flow analytics provides the best and cheapest means of de-anonymizing or profiling this traffic. According to a paper entitled “On the Effectiveness of Traffic Analysis Against Anonymity Networks Using Flow Records” by Sambuddho Chakravarty, Marco V. Barbera,, Georgios Portokalidis, Michalis Polychronakis, and Angelos D. Keromytis they point out that in the lab they can qualify that “81 Percent of Tor Users Can Be Hacked with Traffic Analysis Attack”. It continues to be a cat and mouse game that requires both new innovative approaches to find ToR weaknesses coupled with correlation attacks to identify routing paths. To do this in real life is becoming much simpler but the real challenge is that it requires cooperation and coordination of business, ISPs and governments. The deployment of cheap and easy to deploy micro-taps that can act both as a ToR relay and a flow exporter concurrently combined with a NetFlow toolset that can scale hierarchically to analyze flow data with path analysis at each point in parallel across a multitude of ToR relays can make this task easy and cost effective. So what can we do about ToR today? Even without de-anonymizing ToR traffic there is a lot of intelligence that can be gained simply by analyzing ToR Exit and relay behavior. Using a flow tool that can change perspectives between flows, packets, bytes, counts or tcp flag counts allows you to qualify if a ToR node is being used to download masses of data or is trickling out data. Patterns of data can be very telling as to what is the nature of the data transfer and can be used in conjunction with other information to become a useful indicator of the risk. As for supposedly secured networks I can’t think of any instance where ToR/Onion routing or for that matter any external VPN or Proxy service is needed to be used from within what is supposed to be a locked environment. 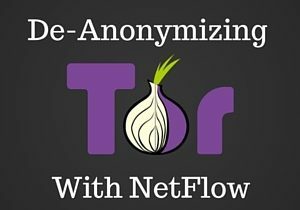 Once ToR traffic has been identified communicating in a sensitive environment it is essential to immediately investigate and stop the IP addresses engaging in this suspicious behavior. Using a tool like NetFlow Auditor’s advanced End-Point Threat Detection allows NetFlow data to be correlated against hundreds of thousands of IP addresses of questionable reputation including ToR exits and relays in real-time with comprehensive historical forensics that can be deployed in a massively parallel architecture.